All tiers of government have a role to play, although local councils are at the forefront of planning for change for their communities. Local councils have a legal responsibility to consider climate risks because they are obliged to minimise the risk of harm to population and property, protect their own council assets and protect and manage the foreshore and tidal areas. Local councils also take a leadership role in educating and inspiring their communities to plan and take action to adapt to a changing climate. Local councils are legally required to consider climate risk using the best available knowledge. Community engagement is an essential component of adaptation planning and implementation, but it is unlikely to be straightforward. keep communication channels open and active throughout. understand the decision-making structures in your organisation and the pathways that must be followed to achieve a decision. Managers of coastal enterprises and utilities need to consider adaptation for the security and profitability of their own businesses as well as for the resilience of the community. 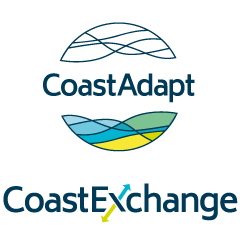 All tiers of government play a role in planning for adaptation to climate change in the coastal zone. Federal government has a role in strategic policy development for nationally significant environmental issues – which includes climate change – but also exerts influence through funding research programs, supporting national coordination (e.g. funding NCCARF) and its significant role in natural disaster recovery and response. State and territory governments play a role through ensuring that regulatory frameworks are in place, particularly for relevant areas such as planning and development, infrastructure, environmental management, funding, guidance and data. While there are some variations between jurisdictions (described in Jurisdictional differences), many of the broader ideas and challenges will be common across the country. Local governments are in the front line in planning to adapt to climate change. Depending on the level of climate risk they face, some local governments will need to do more, sooner, than others to adapt. Local governments already have a number of statutory and non-statutory responsibilities in managing natural and human-induced risks. They also play a strategic and practical role in managing the coast through responsibilities for land use planning, emergency management, foreshore and tidal land management and educating the community about the need to plan for a changing climate. A key concern for many local governments in managing climate adaptation is their legal liability. Local councils in each state are legally required to consider climate risk using the best available knowledge and standards. Further information about this issue can be found in Information Manual: Legal Risk. One of the key needs, but also one of the biggest challenges, is to engage the community in planning to adapt. Engaging the community over a complex issue such as climate change – which has many uncertainties, is highly contentious, seems far into the future and may result in loss of property values and even properties – is unlikely to be easy. We offer some guidance and case studies in Information Manual: Community Engagement. The essence of effective community engagement is to build trust with your community: firstly, take advantage of existing networks in the community; secondly, begin sooner rather than later, even though many councils find it is difficult to know what to do or how to begin. It is also vital to engage within the council organisation itself. We discuss how and why to get your organisation involved in planning for climate change risks in Getting organisational buy-in. One route to this is to better understand the decision-making structures in your organisation and the pathways that must be followed in order to achieve a decision, as this understanding will help you build support and a case for change. A key ingredient for successful adaptation at the local scale is leadership. This can mean formal leadership by council-elected representatives or staff or informal leadership by a community group or leader. Other types of coastal decision-makers with a role in adaptation include utility providers where these are privatised, businesses that depend on the coastal location for their livelihood and those businesses that are on the coast reasons, such as the concentration of population or availability of resources. All of these can help the resilience of the wider community by being involved in adaptation planning for their own enterprise as well as in community-wide planning (see Building adaptation partnerships). The fishing industry will need to consider whether changing ocean thermal characteristics and currents will alter the location of fishing grounds. Tourism enterprises will need to consider accessibility to beaches and whether erosion will increase under sea-level rise. Will the climate make today’s tourist destinations less favourable? Port operators and users will need to consider accessibility and operation. Will access roads be affected by flooding to a greater degree/more frequently? Will port operations (cargo movement, etc.) be hampered by sea-level rise? Aquaculture businesses may find they need to change their operations to address risks from ocean warming and acidification. A small to medium-sized business may find it useful to work through the decision making tool C-CADS to begin their adaptation planning. Climate impact sheets are provided for sectors including Tourism, and Fisheries and aquaculture. Local champions and respected members of the community industry can also play a vital role in gathering support for different initiatives and providing community leadership.